A teacher at Franklin Community High School was suspended from the school after he was arrested on suspicion of child solicitation. FRANKLIN, Ind. -- A teacher at Franklin Community High School was suspended from the school after he was arrested on suspicion of child solicitation. According to Franklin Community Schools, Alex Brickens, a teacher and assistant choir director, was suspended Monday pending an investigation by the Franklin Police Department. The details of the arrest are not known. 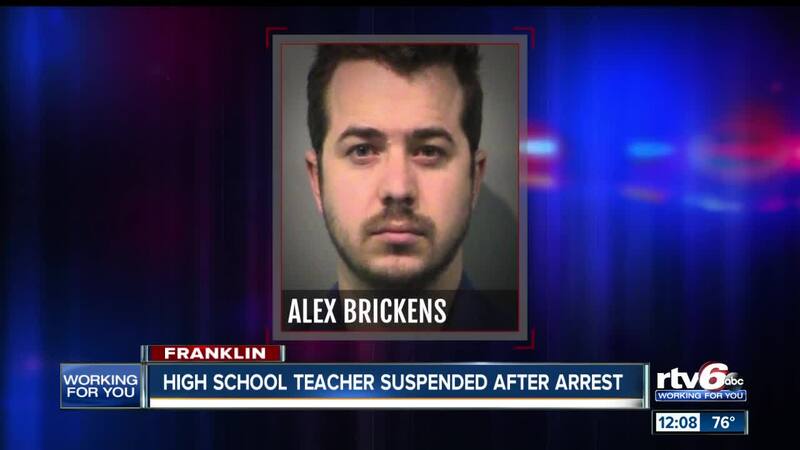 Brickens was a teacher at Center Grove Middle School Central, but resigned in May 2017. He continued to be an assistant football coach for MSC until October 2017, the school said. There have been no reported issues with students while he was at Center Grove. Steve Ahaus, the principal of Franklin Community High School, sent a letter to parents of students in the choir program. In the letter, Ahaus said he had a meeting with all choir and show band students, and praised the students who came forward with information. "It was not an easy decision for those students, but they absolutely did the right thing. We stress at every opportunity we have with students the importance of reporting what they hear and know. We are thankful for what these students did and want to make sure they are supported in the coming days," Ahaus said. I am emailing you to make you aware of a meeting I had with all choir and show band students this morning. The meeting was an attempt to share information in two ways: the first part of the meeting involved providing students with what limited information we are able to share about an incident involving Mr. Brickens, Assistant Choir Director. The second part of the meeting was to share some of my personal thoughts and support for all of them. I opened the meeting by letting them know that we were made aware of Mr. Brickens’ arrest yesterday. Throughout this process, we have been in cooperation with the Franklin Police Department and sharing information under their guidance. We are not able to comment on these legal and personnel issues at this time. The meeting then moved to the role students played in this process and how we can support all of our students through this difficult time. We were able to deal with this issue because some very courageous students were willing to report what they had heard or knew. While I did not use individual names, I praised the students who came forward with information. It was not an easy decision for those students, but they absolutely did the right thing. We stress at every opportunity we have with students the importance of reporting what they hear and know. We are thankful for what these students did and want to make sure they are supported in the coming days. Any negative actions taken towards the students who shared information will be dealt with in a disciplinary way. I also wanted to share with the group that we are available for support. Dr. Clendening, central office staff, and counselors were in attendance as I shared information. While our ability to talk about the case is limited, our ability to talk with them through the emotions of this incident is not. We want to be able to help them in whatever way we can. The actions that led to this arrest are not acceptable and not who we are at Franklin Community High School. In the coming days, I would encourage you to let our counseling staff know if we can support your sons and daughters in any way. If they have additional information they feel would be important for the school and police to know please have them share that information with school staff or administration.